MINNEAPOLIS & REHOVOT, Israel--(BUSINESS WIRE)--Dec. 20, 2017-- Stratasys (NASDAQ: SSYS), a global leader in applied additive technology solutions, today announced that Vespers, a series of breakthrough 3D printed death masks designed and 3D printed in collaboration with Neri Oxman, has been acquired by the National Gallery of Victoria in Melbourne, Australia. The museum, which is the oldest and most visited gallery in Australia, hosts the inaugural ‘NGV Triennial 2017’ exhibition until 15 April 2018 – where the death masks will premiere. The NGV Triennial is a celebration of contemporary art and design practices, featuring the work of more than 100 artists and designers from 32 countries, including works from Yayoi Kusama, Xu Zhen, Guo Pei, Ron Mueck and Iris van Herpen, to name a few. The artists and designers were selected for their diversity and dynamism of practice, including those embracing cutting-edge technologies, from 3D printing to robotics. Highlighting some of the pressing issues being explored by artists and designers today, visitors will have an opportunity to contemplate the social, cultural, scientific and physiological questions of our contemporary world. Debuted at London’s Design Museum in November 2016 to great acclaim, Vespers comprises 15 masks in three sub-series, portraying the past, present and future. 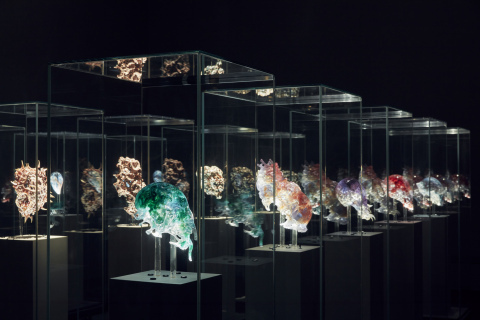 The collectionexplores the themes of ancient traditions and future technologies and speculates about the preservation of life, both cultural and biological. Oxman, along with her team, led the creation of Vespers, which forms part of Stratasys’ ‘The New Ancient’ 3D printed art and design collection. Oxman’s Vespers epitomize the theme of Stratasys’ The New Ancient Collection, which unifies historical crafts and designs of past civilizations with cutting edge technologies, to reimagine design in the modern world. The collection balances the dichotomy between the tribal crafted indigenous qualities with the bio technological advancement. One of the primary sub-series of the Vespers collection, entitled ‘Past’, looks at historic origins, exploring life through the lens of death. Inspired by ancient masks, this sub-series utilizes five material combinations to emulate colors commonly found in cultural artefacts across regions and eras, with impressive accuracy. With the implementation of Stratasys’ unique J750 full-color and transparent multi-material 3D printing technology, Oxman’s team has created 3D printed objects that, for the first time in history, accurately reproduce the variety and nuance of ancient crafts. To see Vespers, visit the NGV Triennial exhibition in the NGV International building atThe National Gallery of Victoria in Melbourne, Australia, running from 15 December 2017 to 15 April 2018.